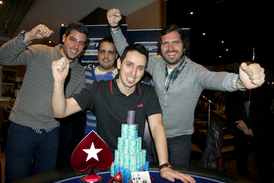 Sergio Aido has won the PokerStars UK & Ireland Poker Tour London main event at the Grosvenor Victoria casino. The €700 + €70 no-limit hold’em event attracted the largest crowd ever assembled for a poker tournament in the English capital – 1,099 players created a prize pool of £746,221 with 144 players getting paid. Aido started the day fifth out of eight in chips but his aggressive style paid off and he got heads up with Thomas Ward from the UK with a 10 million to 6 million chip lead. The pair decided to flatten the pay structure and did a deal to play off for £20,000. Ward initially clawed his way to top in chips but lost two big hands against Aido’s A-J, the final of which with 10-10 sealed his fate and thrust Aido to victory and a spot in tonight’s Champion of Champions event which will give the winner passes for the entire next season of the UK & Ireland Poker Tour.